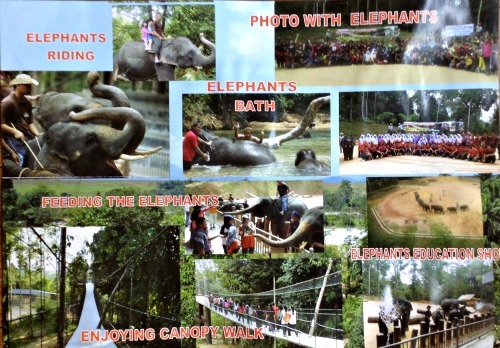 Kenyir Elephant Conservation Village (KECV) is a new attraction in the Lake Kenyir area of Terengganu. It was built in 2012 on a 256 hectare site of which 90% has been left in its natural forest state in order to provide a home for the elephant orphans who live here. The main aim of KECV is to provide a sanctuary for rescued elephants whose life in the wild in Malaysia is threatened by habitat loss and ivory poaching. Creating a tourist attraction and increasing employment for local people are secondary goals. There are currently 13 elephants at KECV. The youngest two, both females, are just 2 years old while the Grandma of the herd, named Teh, is 32. Do not forget that elephants can be dangerous. 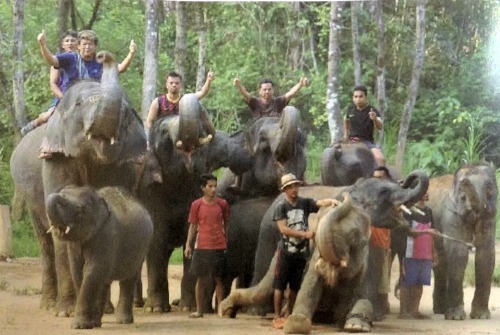 Even with the most professionally run parks and the best trained mahouts, accidents have been known to happen in similar elephant shows around the world. Ticket prices are not cheap, especially for foreign guests! Price does not include elephant rides or elephant feeding. For elephant feeding you can buy a bucket of sugar cane for RM5. No outside food is allowed, for you nor for the elephants. You can get 10% off by booking online on KECV’s website and discounts are available for large groups. Special events can be organised by prior arrangement. Closed between 12:30 - 14:30 on Fridays (prayer time). Elephant Educational Presentations take place at 11:30am and 3:30pm daily (4pm on Fridays). Allow up to 3 hours to complete your visit. Change of clothing if you are planning to get wet helping out at elephant bath time. No bikinis or skimpy swimsuits. There is a café where you can refuel and rehydrate. In terms of attractions, this place is very similar to Kuala Gandah Elephant Sanctuary which is a lot closer to the main population centre of Kuala Lumpur. But KECV’s location is in a beautiful part of Malaysia and you can combine a trip with a visit to scenic Lake Kenyir and the charming city of Kuala Terengganu. The ticket price is expensive by Malaysian standards but it costs a lot to maintain an elephant (up to 250 kg of food per day!) so think of your expense as a contribution to the welfare of the elephants. The elephants appear to be healthy and well looked after. Having said that, I wonder whether KECV will be able to attract enough visitors to continue as a private enterprise without support from the government’s wildlife department. As you can see, KECV is a long way away from Kuala Lumpur (7 hours drive) and even further from Johor Bharu, Penang or Singapore, but only about an hour’s drive from Kuala Terengganu. You can find details of bus services on KEVC’s official website. To view a wide selection of nearby hotels at discounted rates, click on the Agoda advert below or search box below.